Only one card is shown at a time, and clicking the tab for another brings it to the front. Each section is listed as a tool in the Structure Analysis category. Tools can be started in several ways. The Distances section of Structure Measurements is a table of distance monitors (measurements that update if there are changes). The Create button creates a distance monitor between two atoms that have been selected (exactly two atoms must be selected). Picking one atom and Shift-double-picking the second atom (that is, doubleclicking it with the button assigned to picking) elicits a button marked Show Distance. Clicking it creates the distance monitor and leaves the atoms in a selected state. Clicking elsewhere removes the button without creating a distance monitor but leaves the atoms in a selected state. The command distance can also be used. Atoms can be listed in a simple style consisting of residue name, residue specifier (number.chain), and atom name, as shown in the figure, or with command-line specifiers (see the Adjust Torsions figure). Atomspec display style in the General preferences controls which style is used. Clicking on a distance listing allows it to be deleted with the Remove button. If there is only one distance monitor, it is not necessary to click on its listing before using Remove. Clicking on a distance listing selects the corresponding distance monitor pseudobond and deselects any others; if the distance monitor is already selected, it is deselected. 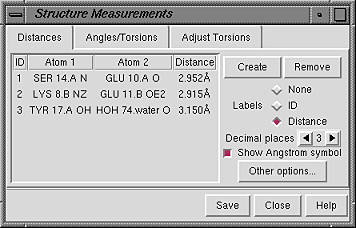 The Decimal places and Show Angstrom symbol settings control how distances are reported in the table and (when Labels is set to Distance) in labels. The Decimal places can be changed by clicking or holding down one of the arrows on either side of the value. Of course, decimal places beyond those present in the input coordinates are not very meaningful. The lines drawn to represent distance monitors are pseudobonds in a group named distance monitor. Clicking Other options... brings up a list of pseudobond attributes for this group, allowing changes in properties such as color, linewidth, and whether the lines are dashed. 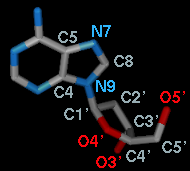 When an individual pseudobond is selected, its attributes can be altered with the Selection Inspector. The Angles/Torsions section of Structure Measurements is a table of angle monitors (measurements that update if there are changes). A "bond angle" is measured for three atoms and a "torsion angle" for four atoms; however, it is not necessary for the atoms to be contiguous or even bonded to one another. Angles/Torsions reports changes but cannot be used to change the angles. To modify torsions, use Adjust Torsions instead. The Create button creates an angle monitor for atoms that have been selected (exactly three or four atoms must be selected; a bond angle is measured when three atoms are selected, a torsion angle when four atoms are selected). Picking two atoms and then Shift-double-picking the third (that is, doubleclicking it with the button assigned to picking) elicits a button marked Measure Angle. Clicking it creates a bond angle monitor and leaves the atoms in a selected state. Clicking elsewhere removes the button without creating a monitor but leaves the atoms in a selected state. Picking three atoms and then Shift-double-picking the fourth (that is, doubleclicking it with the button assigned to picking) elicits a button marked Measure Torsion. Clicking it creates a torsion angle monitor and leaves the atoms in a selected state. Clicking elsewhere removes the button without creating a monitor but leaves the atoms in a selected state. Atoms can be listed in a simple style consisting of residue name, residue specifier (number.chain), and atom name (see the Distances figure) or with command-line specifiers (see the Adjust Torsions figure). Atomspec display style in the General preferences controls which style is used. Clicking on a listing allows it to be deleted with the Remove button. If there is only one angle monitor, it is not necessary to click on its listing before using Remove. The Adjust Torsions section of Structure Measurements is a table of active (rotatable) torsions. The Activate button activates a rotation around a bond that has been picked in the graphics window. Double-picking a bond (that is, doubleclicking it with the button assigned to picking) elicits a menu with the option Rotate Bond. Choosing this option activates the torsion, opens Adjust Torsions (if it is not already open), and leaves the bond in a selected state. Clicking elsewhere removes the menu without activating a torsion but leaves the bond in a selected state. The command rotation or brotation can also be used. An error message will appear if an attempt is made to activate a bond that is terminal (no additional atoms attached to one or both ends), within a ring, or already rotatable. Atoms can be described with command-line specifiers, as shown in the figure, or in a simple style consisting of residue name, residue specifier (number.chain), and atom name (see the Distances figure). Atomspec display style in the General preferences controls which style is used. If the four atoms defining a torsion are called 1-2-3-4, 1 is the Near atom and 4 is the Far atom, which will move when the bond is rotated. The angle in degrees as defined by the current Near and Far atoms is shown in the Torsion column. Torsion can be toggled to Delta; the reported value is then the angle in degrees relative to the starting angle, and there are no Near and Far columns. A bond can be rotated by entering a new angle value (and pressing return), clicking the arrows flanking the angle value, or manipulating the dial. The Dial size can be set to small, medium, or large. Further, torsions can be manipulated in the graphics window with the mouse. This can be done by checking Rotate [torsion] using [button] and choosing the desired torsion and mouse button from the pulldown menus. Deactivate - deactivate the bond rotation and remove it from the table. Note that the torsion will not automatically revert to its original value when deactivated; Revert should be used before Deactivate to retain the original torsional angle. Even if the same rotation is reactivated later, Revert will not work to restore the angle, since the original value has not been saved. 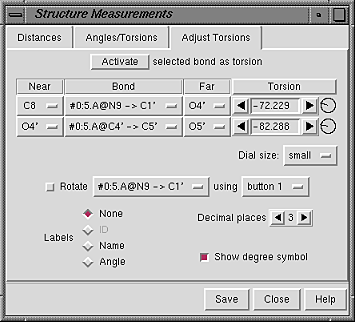 Select - select the rotatable bond and deselect any others; when in the Torsion mode, also select the two flanking bonds (to show all four atoms defining the torsion). When atom 2 is bonded to more than two atoms, there is more than one possible Near atom, and alternatives (if any) are available in a pulldown menu from the current Near atom name. Likewise, when atom 3 is bonded to more than two atoms, there is more than one possible Far atom, and alternatives (if any) are available in a pulldown menu from the current Far atom name. For the first torsion in the example (figures above), there are two choices for the Near atom, C8 and C4, and two choices for the Far atom, O4' and C2'. For the second torsion, there are two choices for the Near atom, O4' and C3', and only one possible Far atom, O5'. Of course, if Reverse is used, the Near and Far choices are interchanged, and in the Delta mode, there are no Near and Far columns. The Decimal places and Show degree symbol settings control how angle values are displayed when Labels is set to Angle. The Decimal places can be changed by clicking or holding down one of the arrows on either side of the value.